That’s about as apt a description of Keillor’s contribution as I’ve read. Last night, Keillor and all of the Prairie Home Companion crew broadcast the show from Kresge Auditorium at the Interlochen Center for the Arts here in northwestern Michigan. 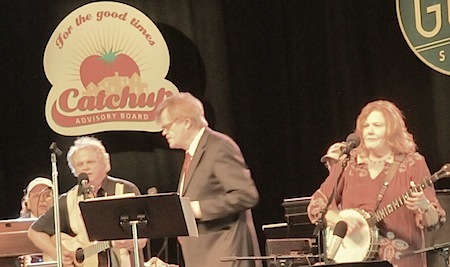 It was a lovely, funny performance that was made even more endearing by the fact that the show’s founder and host announced in March that he would retire from Prairie Home in the spring of 2013. He’ll be 70 years old then and even for a writer and producer with the stamina to create and perform in well over 1,000 shows — last night’s was the 1,291st according to the program guide — there comes a time and Keillor feels it. He had a mild stroke in 2009. Like so many of the 4 million people that regularly tune in each week, I’ve listened to Keillor and his crew for a very long time. Way back in my Charleston, S.C. days as a young writer and reporter a friend, Bill Kovarik, who now teaches journalism at Radford University, told me about the show. That was 1981. In 1983, during the six weeks I spent crossing the country for the first time, I tuned in on Saturday night, a different state every time, and kept on listening when I reached Sacramento. Keillor’s gift, along with recruiting and keeping the show’s exceptional actors and musicians, is to provide his audience a destination that is familiar and wry, while also introducing unexpected elements that fit. It’s a trust thing. You know what to expect and you know it’s going to be good. It’s kind of like the feeling you got as a kid when Mom and Dad loaded you into the station wagon to go visit Nana and Papa. Actors Sue Scott, Tim Russell, and sound effects specialist Fred Newman joined Keillor for several original skits, including one that explored horror movie themes that could be filmed in the Traverse City region. The first, “Mr. Muskie,” featured a man-eating freshwater fish. The “News From Lake Wobegon” largely focused on a superintendent preyed on by boys graduating from a Minnesota high school. 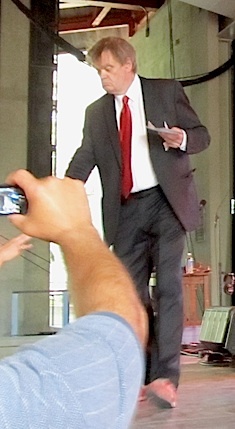 And Keillor tossed into another monologue shout outs to the region’s cherry sector and its regional institutions — the National Cherry Festival in Traverse City early next month, Bob Sutherland’s Cherry Republic, the Cherry Bowl Drive-In in Honor, and the Cherry Hut restaurant in Beulah. Still, Prairie Home’s greatest asset is Keillor himself. He’s built a cultural franchise out of humor, good taste, and his own hopelessly Midwestern self-effacement. Those personality traits also enable Keillor to navigate the treacherous shoals of fame in America. He thrives in the space just outside the white hot beams of national celebrity that burn up so many other talents. It’s not that he doesn’t take risks — in 1987 he left the show for two years to live in Denmark, and in 2006 helped release a movie of the show directed by Robert Altman that was almost incomprehensible. It’s just that Keillor, quite obviously, is the smartest guy in the room and knows what he’s doing. His intelligence, though, seems so approachable. Loved your article. I have listened to Keillor in the car for many years. I see your comments on Facebook through Andy, Laura others and this time it was Peppi. You guys really all turned out so well. What a class you were at WPHS. Des cours de guitare complets et progressifs avec vidéos complètes pour rendre l’aprpentissage encore plus facile et ludique. vous allez également apprendre les accords majeurs et mineurs à la guitare. Next PostNext Demand for Energy Tests Water Supply and Economic Stability in China and the U.S.